It's amazing that I came up with a dinner that didn't have meat as a main dish. I wanted something warm and came across this potato recipe. It could be a side if you made it with smaller potatoes, but I chose to use large baking potatoes and make it the main item. We had it on a nice cool day and it was just what we needed to feel like it was actually fall here. Next time I may use more sour cream, but it was pretty good as is. Im entering it directly how the website states, with my variations included. Carefully cut off the top third of the cooked potatoes; reserve the tops for another use. Scoop out the insides into a medium bowl. Place the potato shells in a small baking dish. 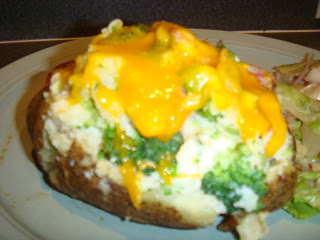 Add 1/2 cup Cheddar, sour cream, salt and pepper to the potato insides and mash with a fork or potato masher. Add scallions and the potato mixture to the broccoli and meat; stir to combine.